The largest, most famous, and most fre­quented of all the streams in the Ashokan Water­shed is the Eso­pus Creek. The Eso­pus Creek drains 75% of the water­shed, is an eco­nomic engine for the water­shed Towns, a vital water sup­ply, and pro­vides rich and abun­dant aquatic and ripar­ian habitats. The stream above the Ashokan Reser­voir is com­monly referred to as the Upper Eso­pus Creek (and the Lower Eso­pus Creek below the Ashokan Reser­voir) and cov­ers 192 square miles. The entire 26 miles of the Eso­pus Creek main­stem flows “clock­wise” in a sweep­ing arc from the head­wa­ters at Win­nisook Lake on Slide Moun­tain to the Ashokan Reser­voir through the Ulster County Towns of Shan­daken and Olive. There are nine pri­mary trib­u­taries from Big Indian to Boiceville and many smaller peren­nial and inter­mit­tent streams that join the creek before it enters the Ashokan Reservoir. Upper Eso­pus Creek has a trib­u­tary net­work of at least 330 stream miles that drain some of the tallest and most rugged Catskill ter­rain, includ­ing 21 peaks higher than 3,000 feet above sea level. The slopes along Eso­pus Creek range from 13% in the cas­cad­ing head­wa­ter reaches, down to 3% — 0.5% as the stream descends to Boiceville. Any stream with a slope over 2% is man­aged dif­fer­ently as a “moun­tain stream” com­pared to lower gra­di­ent streams. This is sig­nif­i­cant because man­age­ment of steep, moun­tain streams is dif­fer­ent than for lower gra­di­ent streams. All val­ley side slopes in the Upper Eso­pus Creek water­shed are clas­si­fied as “steep to extremely steep” with val­ley bot­tom widths vary­ing from 144 feet in the head­wa­ters to around one-half mile (2,428 ft.) in the lower reaches. Much of the vari­a­tion cor­re­sponds to topo­graphic fea­tures asso­ci­ated with the ero­sion and depo­si­tion of the last ice age. NYS Route 28 runs along­side approx­i­mately 13 miles of the Upper Eso­pus Creek from Boiceville to Big Indian and is the major east/west artery con­nect­ing Kingston, NY with the west­ern Catskills. Here the creek and the road occa­sion­ally come into con­flict with one another dur­ing floods. Man­age­ment of flood­ing, ero­sion, stream­side veg­e­ta­tion and wildlife habi­tat, and water dis­charged from the Shan­daken Tun­nel are top issues for com­mu­nity mem­bers, while water qual­ity is the fore­most con­cern for Fed­eral and State agen­cies and New York City. The Eso­pus has been a haven for anglers since the local Native Amer­i­can tribes fished its shores in Pre-Columbian days. By the late 19th and early 20th Cen­tury, the Eso­pus Creek and the sur­round­ing water­shed were becom­ing more widely known for the fish­ery, and became the birth­place of Amer­i­can dry fly fish­ing, a pop­u­lar sport to this day. 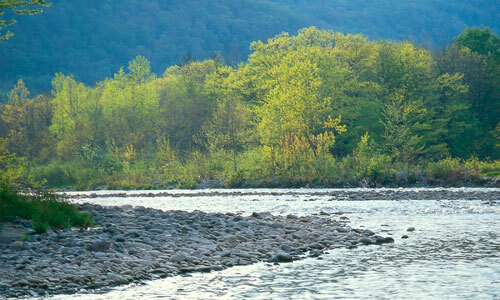 Abun­dant num­bers of Brown and Rain­bow trout as well as other fish species swim in Eso­pus Creek waters. Fish­ing isn’t the only pas­time engaged in upon the Eso­pus. Kayak­ers and canoers enjoy a trip down the water­way dur­ing high flows. The country’s sec­ond old­est slalom race has its home here and has been the train­ing ground for dozens of Olympic hope­fuls. The Eso­pus is also a place to enjoy “tub­ing,” and from Memo­r­ial to Labor Day one can see dozens of peo­ple float­ing down the creek on inflated tubes, one of the most unique Eso­pus Creek activities. The Eso­pus is not with­out its prob­lems. Flood­ing has washed out road­ways and inun­dated people’s homes in some loca­tions. Muddy or “tur­bid” water (a result of ero­sion into the under­ly­ing glacial geol­ogy of the area) has cre­ated con­cerns over water qual­ity, pub­lic and eco­log­i­cal health, and aes­thet­ics. The Eso­pus is des­ig­nated as a “nav­i­ga­ble” river which raises ques­tions about pri­vate prop­erty rights ver­sus pub­lic needs and desires for trans­porta­tion and recre­ation access. These are com­plex prob­lems that may only be solv­able through multi-agency and com­mu­nity partnerships. Through it all, any­one who vis­its the Upper Eso­pus Creek may fall in love with the river and its grand, majes­tic beauty. The Eso­pus Creek has had, and will con­tinue to have a pro­found influ­ence on the land­scape, local com­mu­ni­ties, and the peo­ple who live near it and call the Ashokan Water­shed home. The Ashokan Watershed Stream Management Program is a collaborative effort of New York City Department of Environmental Protection, Cornell Cooperative Extension of Ulster County and Ulster County Soil and Water Conservation District. Family Fun and Fish Day Returns May 19th!